Can you confirm these amateur observations of Liolaemus tregenzai? Type locality: Copahue Volcano slopes (37°50’S; 71°06’W), 2150 m elevation, near Termas del Copahue, Departamento de Ñorquín, Neuquén Province, Argentina. Types Holotype: MLP R. 5274, adult male. Collected by J.A. Scolaro, N. Scolaro, G. Scolaro and F. Tavera, February 6–10, 2006. Diagnosis Diagnosis: A large Liolaemus species belonging to the chiliensis clade diagnosed by Etheridge (1995), because it has a low number (4-4) of narrow supralabial scales, the last one elongated and upturned in the posterior margin, without a bladelike process on the posterior distal tibia, without femoral patch of enlarged scales, without tridentate dorsal scales, and with Meckel’s groove fused (see also Laurent 1992; Schulte et al. 2000; Lobo 2001; Pincheira-Donoso & Núñez 2005). All these traits differentiate L. tregenzai from L. periglacialis, L. kolengh, L. lineomaculatus and L. silvanae, which exhibit the diagnostic traits detailed for the lineomaculatus clade (see Donoso-Barros & Cei 1971; Cei 1986; Etheridge 1995). Etheridge (1995) recognized four or fewer precloacal glands in males of most of the species belonging to the chiliensis clade. In Liolaemus tregenzai these glands are entirely absents, which differentiate this species from almost every taxa into this clade, except from L. coeruleus, L. cristiani, L. flavipiceus, L. neuquensis, and L. thermarum, which do not exhibit precloacal glands. 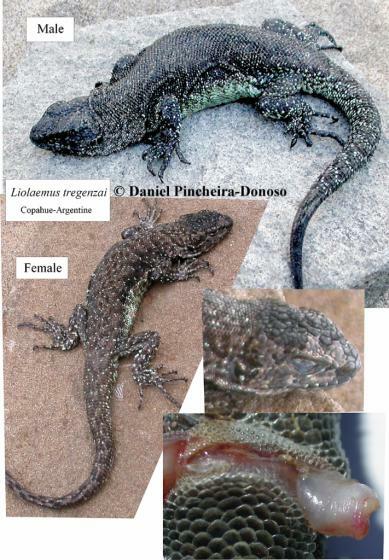 Liolaemus tregenzai differs from L. cristiani in having a Patagonian distribution, and green-bluish ventral coloration with intense black pigment on the throat, chest and abdomen, whereas L. cristiani occurs in the Andes of central Chile, and exhibit a brown-yellowish or copper-yellowish ventral coloration, with total absence of intense black pigmentation in both sexes. Also, in L. tregenzai sexual dichromatism is evident, being absent in L. cristiani. Significant differences in the colour pattern differentiate L. tregenzai from L. flavipiceus. The olive, brown-blackish or chest-nut dorsal coloration and the green-bluish ventral colour with intense black pigmentation characteristics of L. tregenzai, contrast with the yellow dorsal background, black on the head, flanks, throat and chest, and with the greyish or reddish ventral colour with scattered orange or reddish spots observed in L. flavipiceus. Liolaemus tregenzai also differs from L. thermarum, because this last species does not exhibit black pigmentation on the ventral surface, which is whitish with conspicuous pinkish shades. The Liolaemus species lacking precloacal glands that exhibit more phenotypic and geographical similitude with L. tregenzai are L. coeruleus, from Zapala and Pino Hachado (Cei 1986; Pincheira-Donoso 2003) and L. neuquensis, from Copahue (Cei 1986; Videla & Cei 1996), the same area where the new species occurs (see above). Liolaemus tregenzai differs from L. coeruleus in having a body size ranging between 63.4–90.2 mm (see below for details) which contrasts significantly (see above) with the 44.7–60.2 mm in L. coeruleus. Also, the number of scales around the midbody (and therefore, the proportional size of body scales in relation to body size) is significantly different between these species, having L. tregenzai a mean value of 80.63, whereas the mean value in L. coeruleus is 63.4. In addition, while L. tregenzai exhibits a green-bluish ventral coloration, the abdominal and pectoral background in L. coeruleus is blue or sky-blue. Finally, L. tregenzai differs from L. neuquensis in having a significantly larger body size (55.3–61.1 mm in L. neuquensis; see above), and because L. neuquensis shows a prominent hemigular fold, completely absent in L. tregenzai. The same ventral differences detailed for L. coeruleus in relation to L. tregenzai, are valid for L. neuquensis. Comment Liolaemus tregenzai lacks precloacal glands in both sexes. This new taxon, member of the chiliensis clade, is so far known from the Copahue Volcano, Neuquén Province of Argentina, in boreal Patagonia. Liolaemus tregenzai differs from the remaining species of this clade in having a unique combination of morphologic and chromatic traits, such as a large body size, olive or chest-nut dorsal ground colour, with dark brown or blackish pigment on the flanks, green-bluish with intense black pigment on the ventral surface, and evident sexual dichromatism. The ecology of this new lizard is also remarkably, occurring in Andean antarctandic forests, and being common near thawing snows. Etymology Etymology named after Tom Tregenza (Royal Society Research Fellow, University of Exeter), in recognition of his contributions to evolutionary biology.